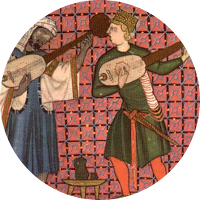 Universo Cantigas is a critical digital edition of the surviving corpus of secular troubadour poetry in Galician-Portuguese. This online edition is the latest instalment of the Glosario da poesía medieval profana galego-portuguesa project (available on this site and at http://glossa.gal) and is supported by the Spanish Ministry of Economy and Competition under the Glosario da poesía medieval profana galego-portuguesa III. Edición crítica dixital das cantigas de amor project (ref. FFI2015-63523-P). The ‘general songbook’ (or ‘general compilation’) is divided according to the three main cantiga genres: de amor, de amigo, and de escarnho e de maldizer. The first phase of this new project (2016-2018) focuses on the first section of the songbook, comprising the cantigas de amor and the rubric for the cantigas de amigo. This section covers manuscript texts 1-640, containing a total of 1683 compositions (based on the Jean-Marie d’Heur referencing system). The aim of Universo Cantigas is to provide comprehensive digital access on a staged basis to all the cantiga poems of the Galician-Portuguese troubadours. The site also offers all the features of an online resource, including continuous updates, unlimited space, scope for additions and expansion, and links to a range of materials related to the editing process that offer valuable insight into the texts. Ferreiro, Manuel (dir.) (2018-): Universo Cantigas. Edición crítica da poesía medieval galego-portuguesa. Universidade da Coruña <http://universocantigas.gal> ISSN 2605-1273 [last revised: dd/mm/yyyy].